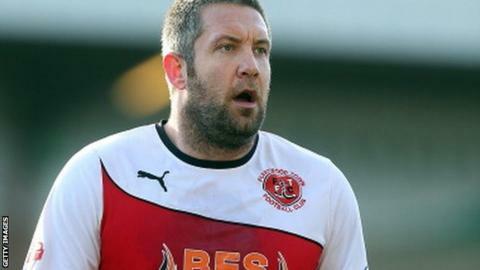 Jon Parkin's goal gave Forest Green a draw against Bristol Rovers. The visitors came closest to breaking the deadlock in the first half but home keeper Sam Russell saved Lee Mansell's free-kick and Matty Taylor's strike was rightly ruled out for offside. The Pirates took the lead in the second half when Andy Monkhouse powerfully headed home Lee Brown's cross. Parkin equalised for the hosts when he inadvertently deflected Marcus Kelly's shot past keeper Steve Mildenhall. "I think we could have done better and we should have done better. "After their goal, I thought our two substitutes looked bright when they came on. "We've got some good footballers in the team but we just needed someone, in the middle of the park, to put their foot on the ball." "I was pleased with our performance but disappointed we didn't get the win. I thought we deserved the win and we created more chances - they really only had a 15-minute spell in the game when they got us under pressure. "But my boys are learning and learning quickly. The lads played well and put a shift in. "Forest Green have got probably double our budget. They've got experienced players and are a very ambitious football club but we've had to cut our cloth and I've got good, hard-working players and the fans have been terrific. "We need to improve but I know we've got improvement in us." Match ends, Forest Green Rovers 1, Bristol Rovers 1. Second Half ends, Forest Green Rovers 1, Bristol Rovers 1. Attempt missed. Neal Trotman (Bristol Rovers) header from the centre of the box is too high. Assisted by Lee Mansell. Attempt missed. Lee Brown (Bristol Rovers) left footed shot from outside the box misses to the left from a direct free kick. Foul by Daniel Coles (Forest Green Rovers). Jamie White (Bristol Rovers) wins a free kick. Neal Trotman (Bristol Rovers) is shown the yellow card for a bad foul. Offside, Bristol Rovers. Stuart Sinclair tries a through ball, but Stuart Sinclair is caught offside. Substitution, Bristol Rovers. Jamie White replaces Matty Taylor. Lee Brown (Bristol Rovers) wins a free kick. Hand ball by Marcus Kelly (Forest Green Rovers). Substitution, Forest Green Rovers. Luke Rodgers replaces Lee Hughes. Attempt missed. Daniel Coles (Forest Green Rovers) header from the centre of the box misses to the right. Assisted by Marcus Kelly. Attempt blocked. Lee Hughes (Forest Green Rovers) right footed shot from outside the box is blocked. Goal! Forest Green Rovers 1, Bristol Rovers 1. Jon Parkin (Forest Green Rovers) right footed shot from the left side of the box to the bottom left corner. Assisted by Marcus Kelly. Attempt missed. Chris Stokes (Forest Green Rovers) left footed shot from outside the box is too high. Attempt saved. Matty Taylor (Bristol Rovers) header from the centre of the box is saved. Assisted by Tom Lockyer with a cross.